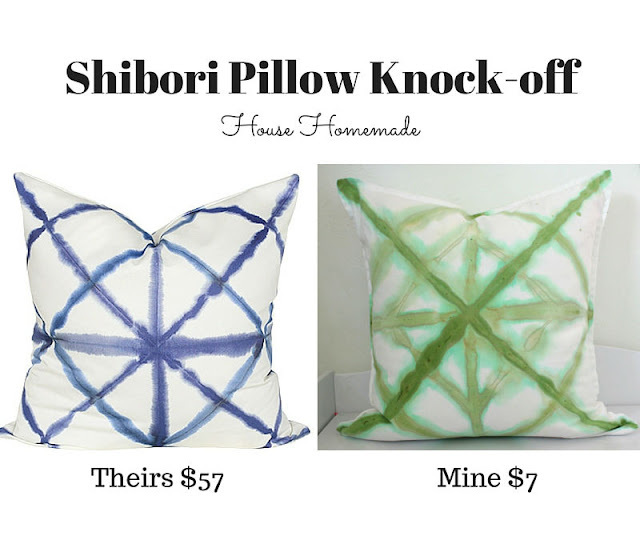 I had no idea what shibori meant but it's a Japanese dying technique. 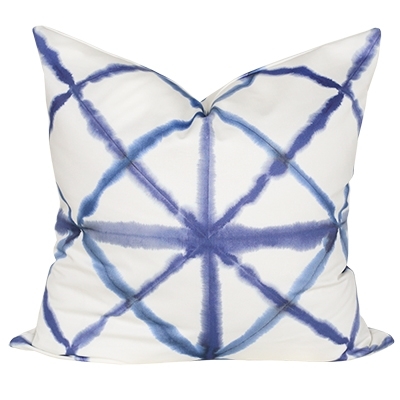 Usually it's done with indigo dye which is so pretty but doesn't really work in my house. But green. I'll use green all day long and forever. Just the pillow case was $57. It's amazing but I said to myself, "self, I can do that". Side note: Thinking "I can do that" saves me so much money because even if I never actually do whatever it is, at least I'm not buying the original. Amen? Just so happens I had two white Ikea pillow covers just asking to be part of my grand experiment. I say experiment because my first attempt wasn't great. Luckily these pillows have two sides and I love to frequent Ikea. So, number 1. I could make sure the messed up side is hidden or number 2. I can go buy one more cover and do it again. $7. No big deal. Well, I did it! One morning after breakfast, with cereal bowls still on the table, I made shibori looking pillows with items that I bet you already have at home. 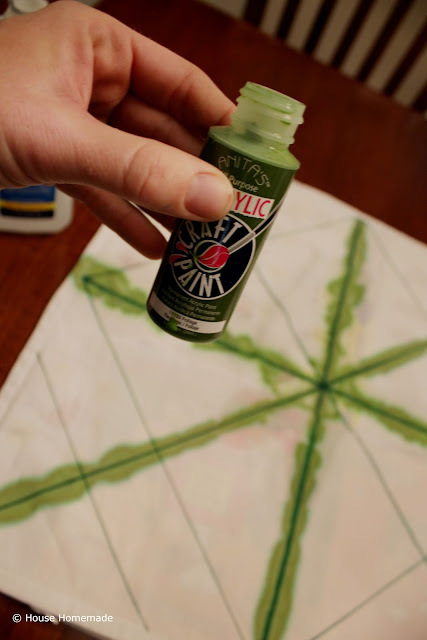 For this project, I used a medicine syringe (the ones for little kids), craft paint, a pencil and water. Now, I am fine with my no-supply-run project but I'm willing to bet that a bottle of liquid Rit dye would make it look even more amazing. Psst. This is the side I messed up on..I thought the green marker I used, would bleed...It didn't. After that, I used a pencil. First up, I made pencil lines diagonally from corner to corner. 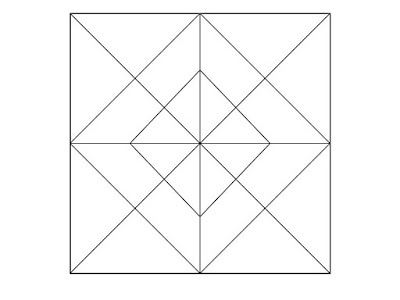 Then a horizontal and a vertical line from side to side and through the center. 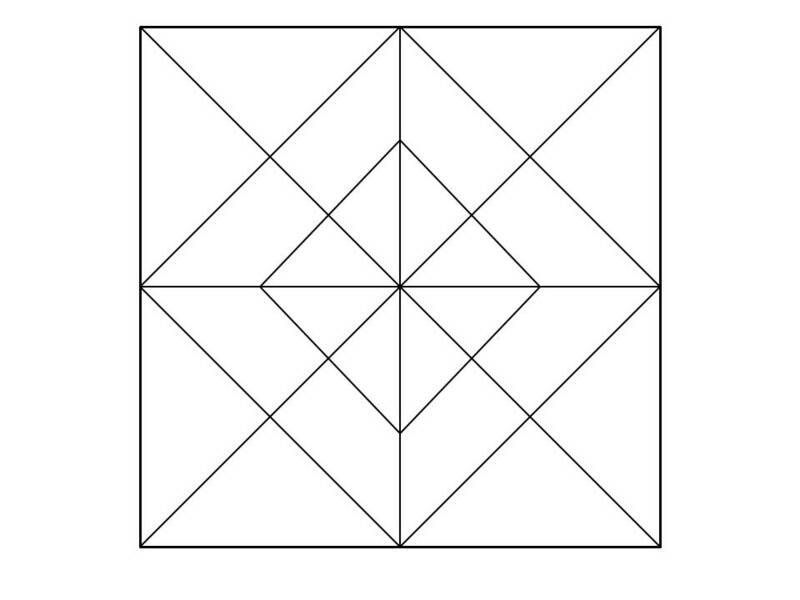 Then, just like the inspiration, I made the two tilted squares in the middle section as well. I made a very impressive diagram for you. *not really but I could have hand drawn it to really keep it classy. I poured some paint and water into a bowl and mixed it well. I wanted it to be very runny. Like green water. Pull it up into the medicine dropper then "draw" over the pencil lines while slowly squeezing out the water. I let them sit for a while so that the paint and water seeped through to the opposite side. 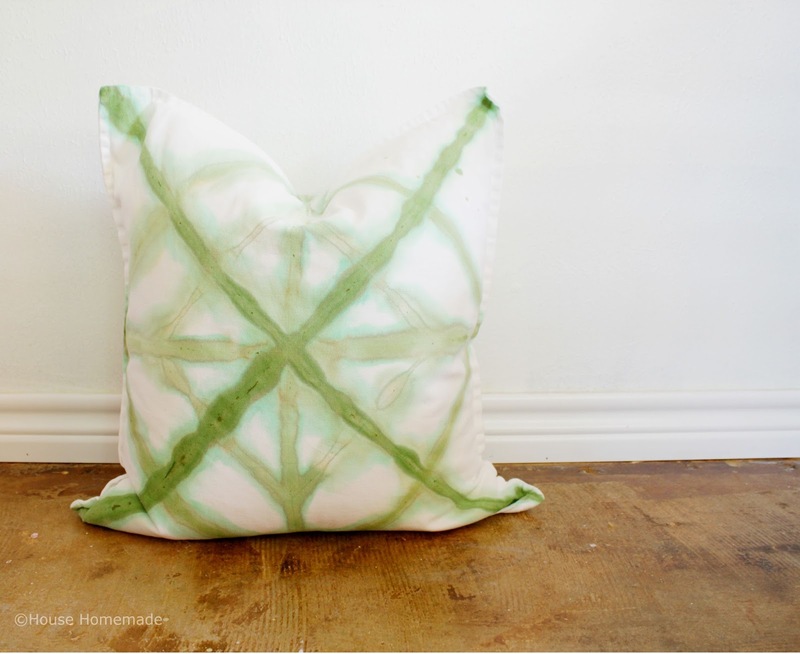 When they dried, I was left with shibori looking throw pillows that I really like! Then I moved them all over the house for pretty pictures and to find them a forever home. *hah no decor in this house has a forever home! Read this and this for proof. To be honest, right now, they are piled on a chair in our bedroom but let me tell you, they look cute there! I think they'll end up in the living room. 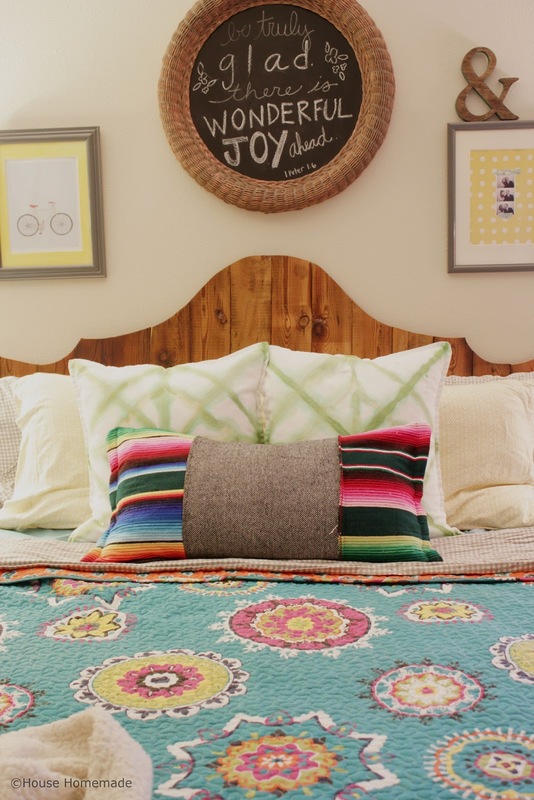 I'm not a tons-of-throw-pillows-on-the-bed kinda girl. I have patterned pillow cases on our normal pillows and that one Mexican blanket lumbar pillow that I throw on top. 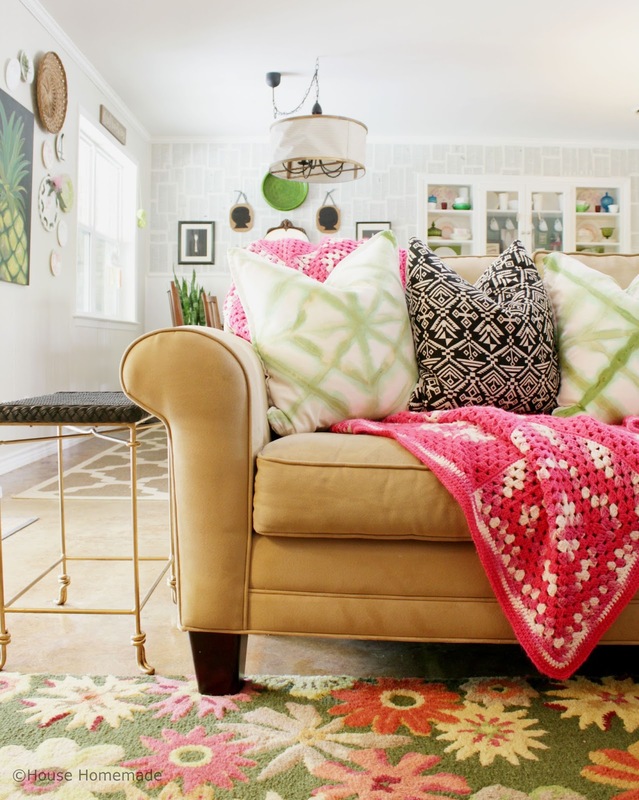 The masses of throw pillows belong on the couches in our house. It was a fun experiment and I'm pleased with the results. Now I kind of have the itch to try with indigo dye after all. What about you? Have you seen rooms with Shibori dyed fabrics? I've been pinning some on Pinterest. If you try your hand at anything, I want to know about it! Make sure you pin for later or to share!